Our latest blogger interview is with Tara from “In The Taratory”. Tara recently featured in a profile piece on the “Her Canberra” website, showcasing her talent as an advocate for Canberra and all the amazing experiences and activities in our home town. Tara is also a community activist, regularly using social media to provide direct feedback to everyone from our local politicians to supermarket chains. I’m glad Tara suggested we have lunch at the Flute Bakery in Fyshwick. The $5 beef curry pies are very tasty and I will definitely be back for more. Who are you Tara? I grew up all over Queensland, went to uni in Brisbane, and then moved to Canberra as a grad in 2008. I started the blog because I knew there was a helluva lot going on in Canberra and I wanted to make sure people knew about it and could be inspired to try things for themselves – whether it’s discovering just how amazing the walk up Booroomba Rocks is or getting ideas for a dinner out on Friday night. 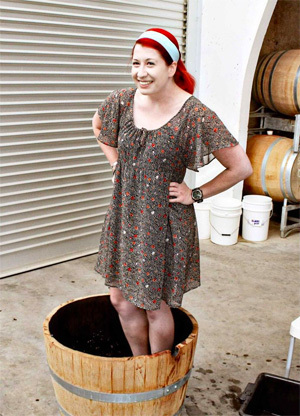 Here’s a recent photo of Tara enjoying some grape-stomping at Yarrh Wineries, just north of Canberra. Where do you live? Belconnen. I never really feel like Canberra was ‘home’ until I moved to Belco. How long have you been blogging? About two and a half years. Apple or Android? Android… I’m not an Apple fan! What Apple did for the market was phenomenal but I think it’s been overtaken now. 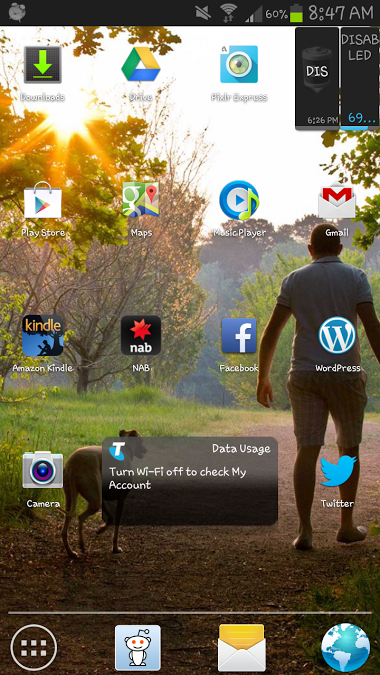 I love how customisable Android is and always has been. Car/bus/bike? When I’m on a bike something happens and I lose all road sense… so I don’t ride much to save others from me! I do love getting around in a car but I’ve started taking the bus more. Boyfriend also has a scooter – it’s my favourite transport for short trips. Outside Canberra I’m a big fan of the train – it works so well in so many cities and countries. Favourite TV show? Borgen and House of Cards – the former for the humanity, and the latter for the inhumanity! Favourite devices? Canon DSLR and Samsung Galaxy S3. Most-used app? Twitter, WordPress, Facebook, Reddit is Fun. Favourite social media? Twitter and Reddit (if you can call Reddit social media). What’s the first thing online you check each morning? Twitter! If there’s breaking news then it will be on Twitter. If there’s a really big story I’ll then head to Reddit – especially if it’s international. What do you worry about at night? That I’m not going to bed early enough! Most exciting recent news? The Belconnen Town Centre Master Plan is being updated. It’s a great opportunity for community participation in a detailed plan of the town’s future. Recent book you recommend? For an easy but intelligent read I love Australian author Liane Moriarty, and her latest The Husband’s Secret is excellent. I’m currently reading Autoportrait by Edouard Leve. It’s short but each line needs to be savoured so it’s taking me a while! There’s an extract in the Paris Review here. Recent online video you laughed at? The Long Story Short series on YouTube is clever and funny. I love this episode in particular. Favourite food? This is going to sound daggy but it’s–hands down–soft boiled eggs with toast (cut into triangles, not soldiers. Soldiers means the structural integrity of the toast is lost!). It’s so simple but quick and tasty, and it’s especially good with free-range eggs, good multigrain bread and Pepe Saya butter. This entry was posted in Meet a #Canberra Foodie and tagged blogger, Canberra, CBR, flute, in_the_taratory, tara.